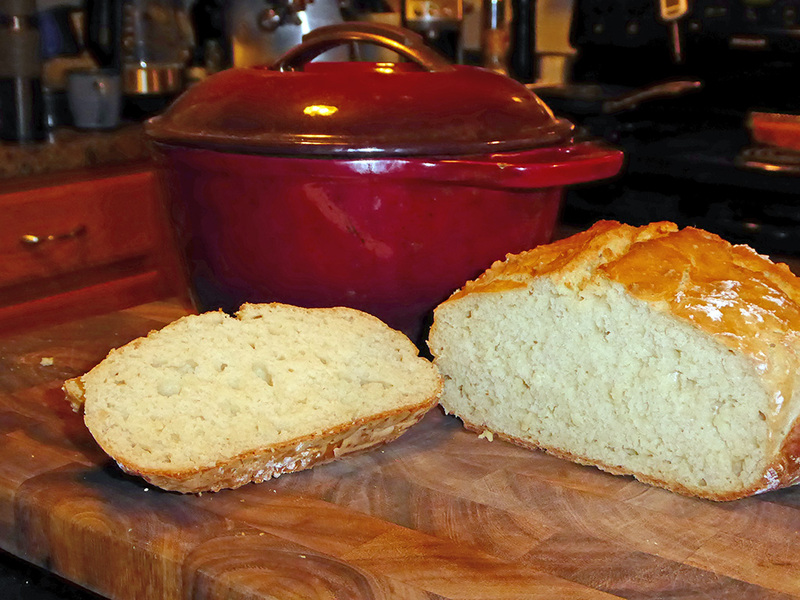 After seeing this ThermoWorks article this morning, I decided it was high time I made soda bread for the first time – the result above. This late date is slightly embarrassing since I’m of Irish extraction (100%, I think) and this is maybe the twenty-fifth or thirtieth kind of bread I’ve made. 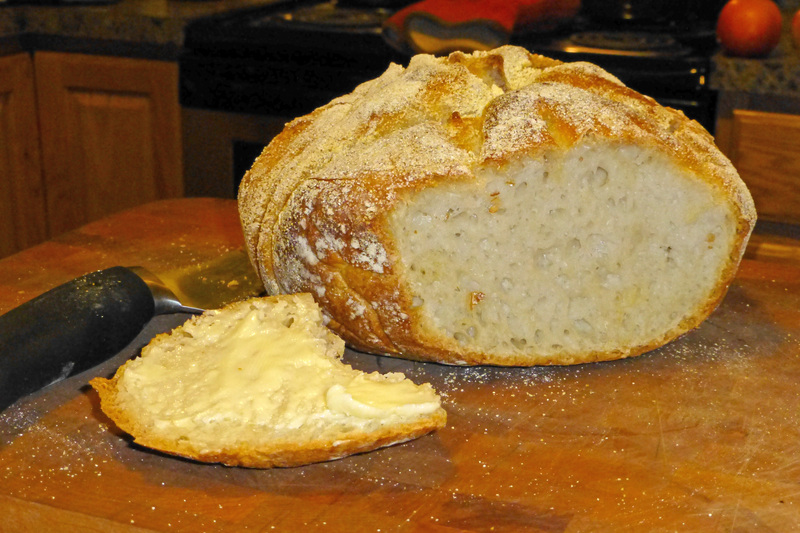 Several years ago, I bought the pictured 3.5 quart KitchenAid Dutch oven (alas, long-discontinued) to get a better shape on the sourdough boules I bake, and figured its smaller size would probably help with this fairly wet dough as well, and it did indeed. It probably sped the baking a bit, too. When I took the lid off at 40 minutes, the central temperature was 203°F/95°C, just a couple degrees and minutes from being done. It’s a fast and tasty bread. I’ll be making it more often than never from now on. My variation on her recipe has toasted pecans swapped in for the walnuts and is enriched with espresso powder and extra chocolate and vanilla. 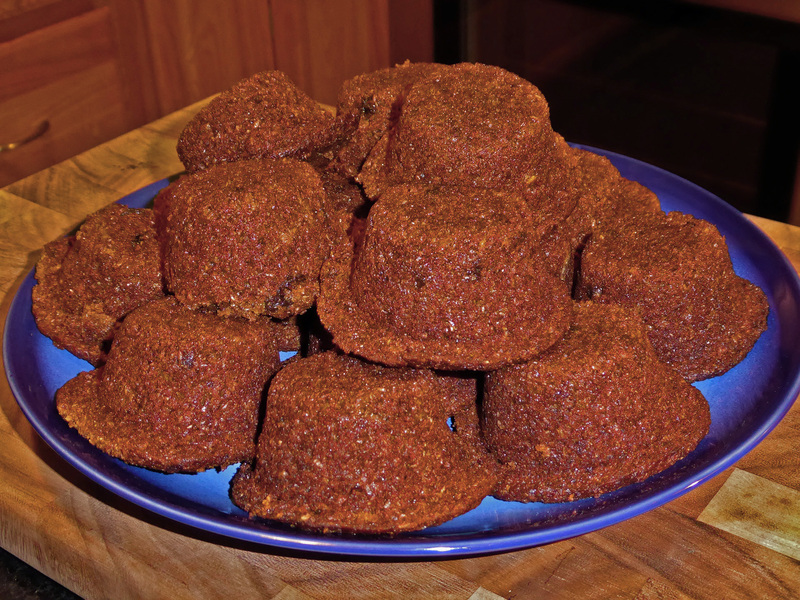 These are quick to make and disappear even faster in a murmur of Mmmms, so you may want to consider a double batch. 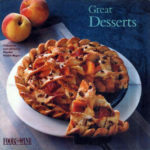 They’re ideal when you’re perhaps a little pressed for time but want a great dessert – whip these up in under an hour, including the time to preheat the oven and toast the pecans, and serve with a scoop of vanilla ice cream. 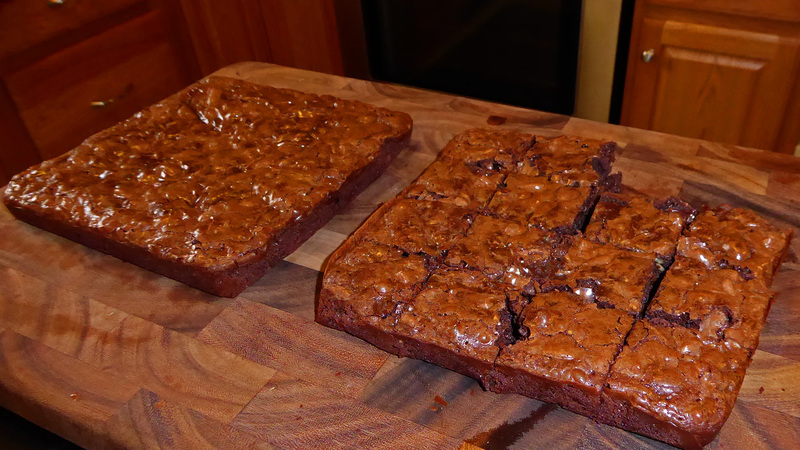 For that still-warm-from-the-oven effect, I recommend microwaving one brownie for 9 seconds. 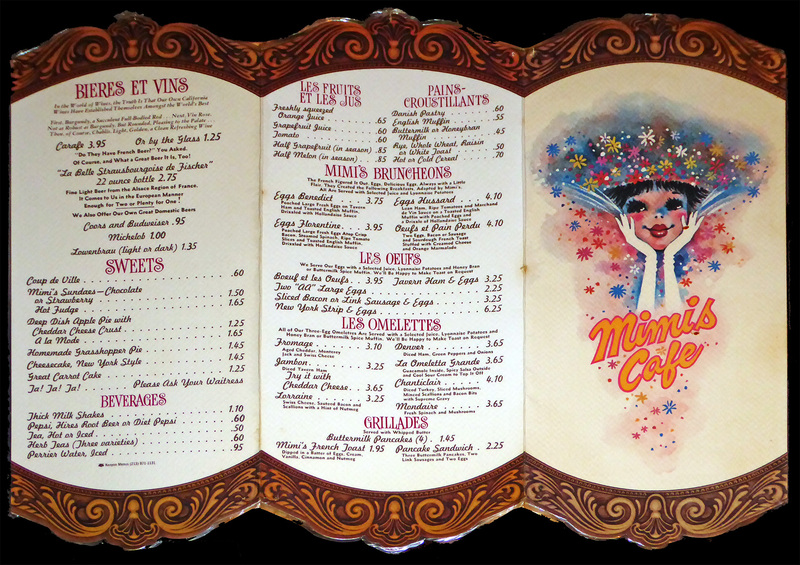 And a napkin. Maybe a Wet-Nap. Preheat oven to 325F/160C. Toast the pecans on a baking sheet for 9 minutes, then remove from the pan and allow to cool a bit. Break each half into four quarters or process/chop them into large pieces. 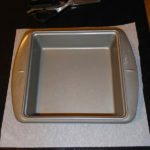 Line an 8×8″/20x20cm pan with parchment paper – see the method below. You can instead butter the bottom and sides of the pan, but these are gooey brownies that really want to stick, even to a well-greased non-stick pan. In a medium saucepan over medium-low heat, melt the stick of butter and the unsweetened chocolate. 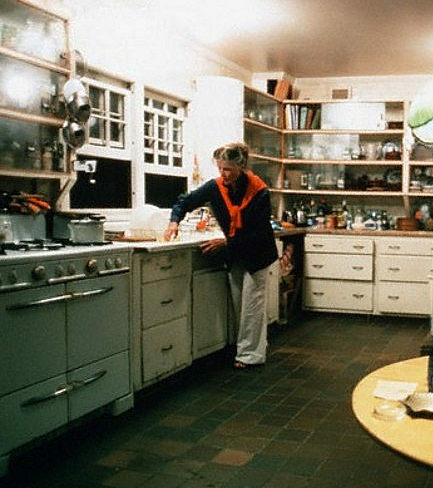 When melted, remove from heat – there’s no more cooktop heat from this point – and beat in the sugar. When the sugar is incorporated, beat in the eggs, then the espresso powder, salt, and vanilla. Fold in the flour, then stir in the toasted pecans and chocolate chips. 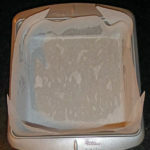 Pour into the parchment-lined pan and bake at 325F/160C for 40 minutes, rotating the pan 180 degrees at 20 minutes. 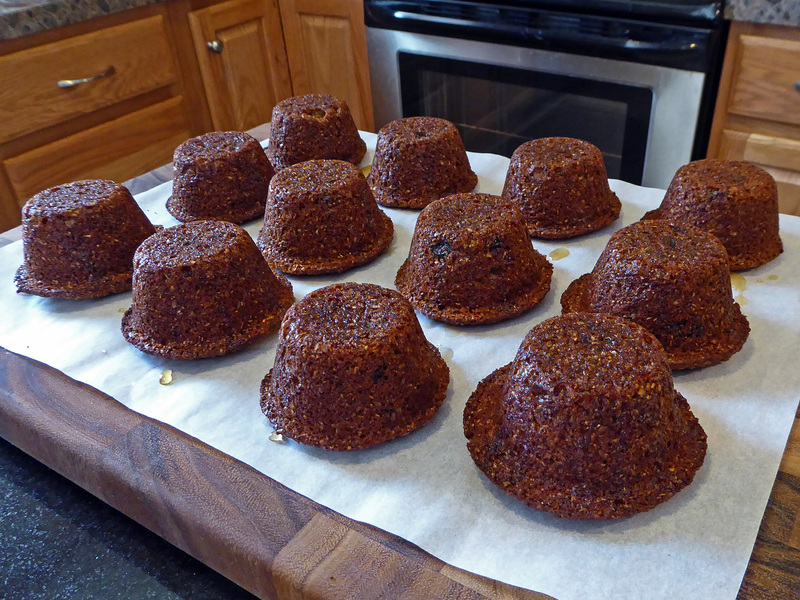 Check them at 35 minutes – if you see the edges are darkening, get them out of the oven because they’re done. 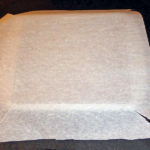 Cool for at least half an hour, then lift the brownies out using the sides of the parchment, peel the paper off, and cut into nine, twelve, or sixteen pieces (3×3, 4×3, or 4×4). A long, thin-bladed knife, cleaned and run under piping hot water between cuts, will help you produce squares instead of a pile of broken brownie pieces. Place the parchment in the pan, overlapping the diagonal flaps. 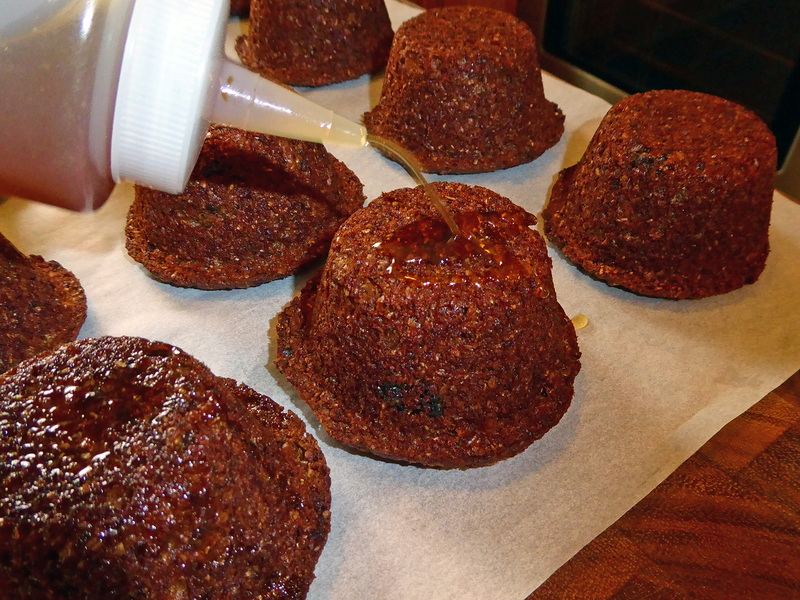 You don’t need to spray the top of the parchment. So long as it’s silicone-treated, it will peel off just fine. Costco often sells 2-pound bags of pecans for US$14-15, which is probably close to what you’d pay for two pounds at a roadside pecan farm stand in the South. However, note that most nuts will go rancid after 6-12 months – walnuts and pecans the quickest by far – but they won’t go off if you freeze them and thaw only what you need for a recipe. Thawing takes just half an hour at room temperature. I use a fair amount of pecans, so I always have two or three bags in my freezer. 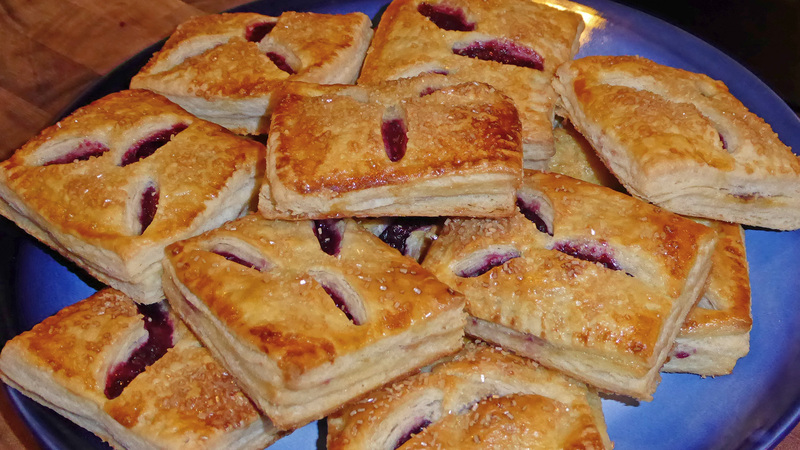 Back in July, I noted King Arthur Flour’s blog entry for blueberry hand pies, and finally got around to making a blackberry version this past weekend. Then I made a bunch more Monday night to bring in to work – the results pictured above – with some adjustments that made them noticeably better. 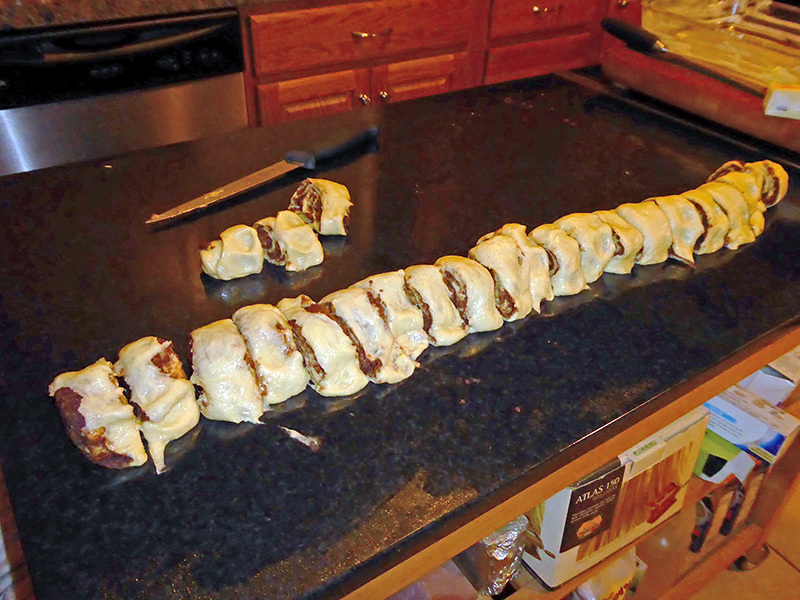 Foremost, I did four turns of the rough puff pastry instead of just the two called for in the recipe. That added only an extra half-hour of chilling and five or six more minutes of pounding/rolling/folding, and it was worth every minute. A friend I shared them with on Sunday had been looking for a fairly simple puff pastry recipe and asked for this one, so I sent her the link and my notes, that email pasted under the line here. I did all the “next time, I’m going to” things mentioned below for version 2 on Monday night and each of them paid off handsomely. 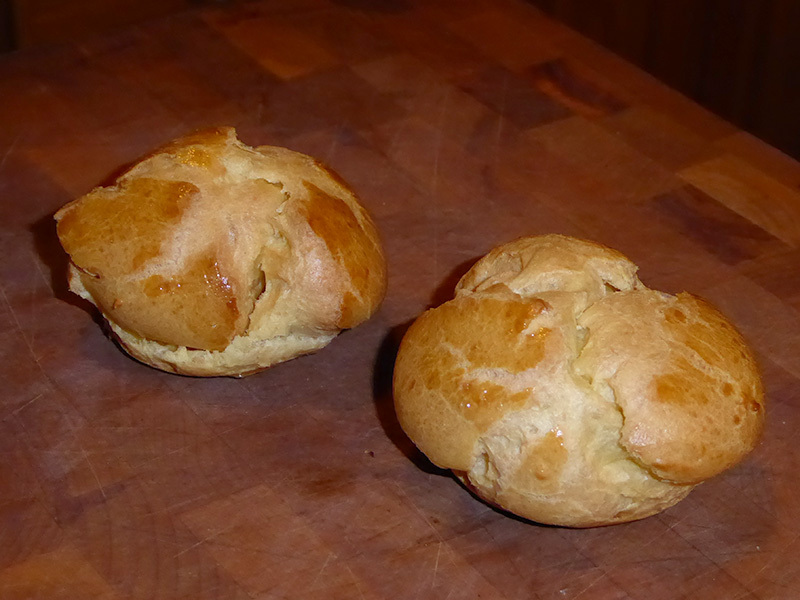 If puff pastry – even this simpler rough puff recipe – seems daunting to you, it isn’t. Scroll through their pictorial blog entry and you’ll see it’s pretty straightforward. I’ve wanted to try my hand at it ever since, some years ago, I saw the price on frozen puff pastry that’s made with actual butter – and quickly moved along, defensively clutching my money clip. Oooowee, that’s some profit! I should add that it wasn’t Pepperidge Farm Puff Pastry Sheets because theirs haven’t been within a country mile of even two molecules of butter. 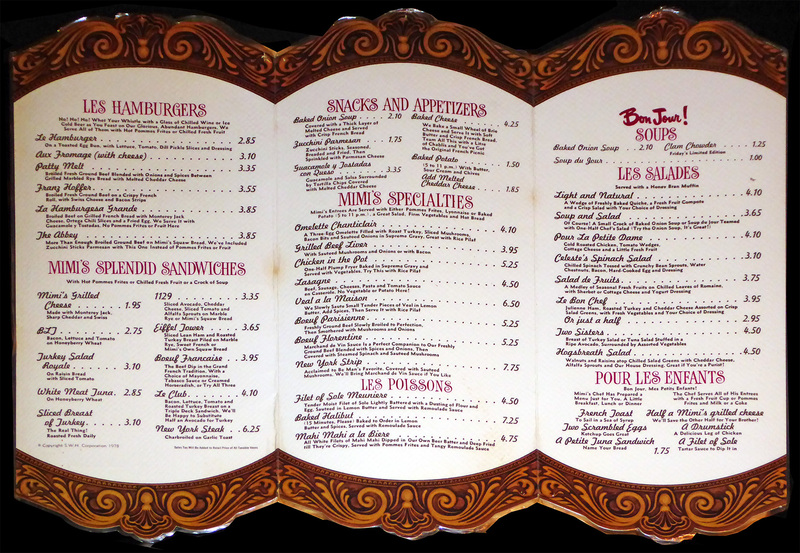 Strictly oils and high-fructose corn syrup in there, friends – not what you would call traditional. There were more pies than people on Tuesday; inside an hour, only five or six crumbs were left on the platter. 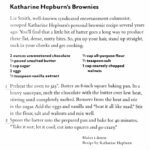 This recipe is going onto my frequently-made list. The changes I made were to 1) switch to blackberries, cutting them in half cross-wise because they were big (though they’re more tart than blueberries, I specifically did not increase the sugar in the filling because I prefer lightly sweet desserts where the fruit has the leading role), 2) add a half-teaspoon of cinnamon to the berry mixture, 3) use Sugar in the Raw to sprinkle on top instead of sparkling sugar because that’s what I have, and 4) use Julia Child’s method for the egg wash: Add a half-teaspoon of water to the egg, mix with a fork, then strain into a small bowl using the fork to further mix in the strainer and get the liquid through. Slackening the liquid and straining out the chalazae – those protein strands that anchor the yolk to the top and bottom of the shell – makes it easier to apply the wash well; coverage can be a bit spotty otherwise. 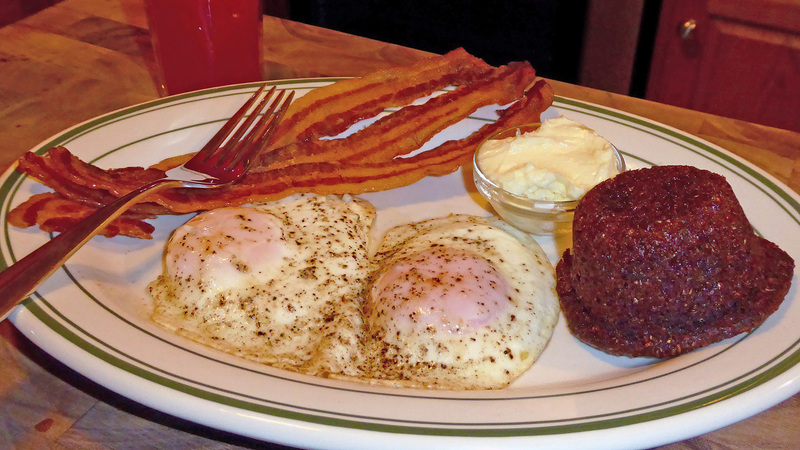 This is especially true of very fresh eggs, where the chalazae are larger and thicker. Note that you can use salted butter. There’s about an eighth teaspoon of salt in one stick of salted, so just reduce the ¾ teaspoon salt in the dough to ½ teaspoon and you’re all set. 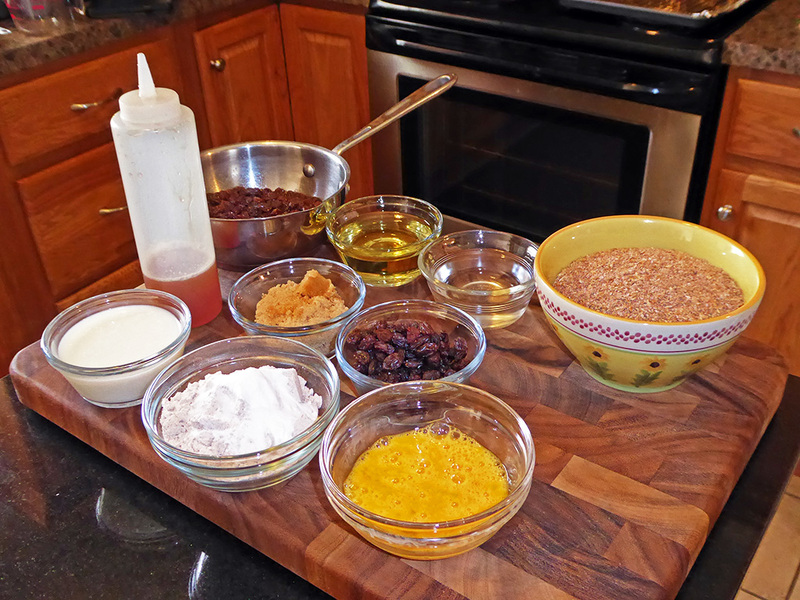 You can also sprinkle the pies with regular granulated sugar instead of larger crystals after the final egg wash. I think it does need that little bit of sweetness on top. Flour your work surface well but not excessively throughout and brush excess off the dough before folding each time. 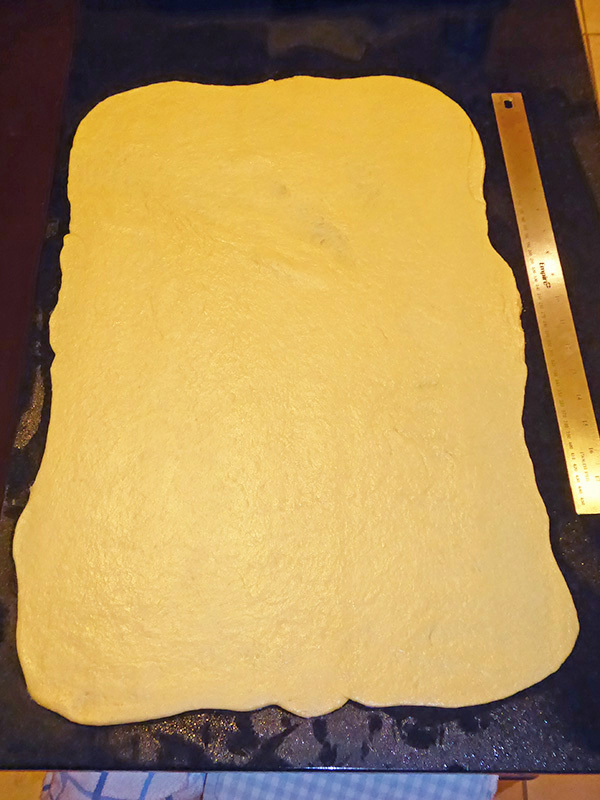 Based on how quickly the dough softened as I worked with it, next time I make them, at the last rollout, I’m going to shape into the final 14×14″ sheet, cut the 3½” squares, arrange them on parchment on a baking sheet, and put them back in the fridge for 20 minutes. Then I’ll take them out and assemble the pies while the dough is nice and firm and get them in the oven. In assembling, I’m going to use a lighter touch with the fork crimping of the edges to allow the sides to rise more. 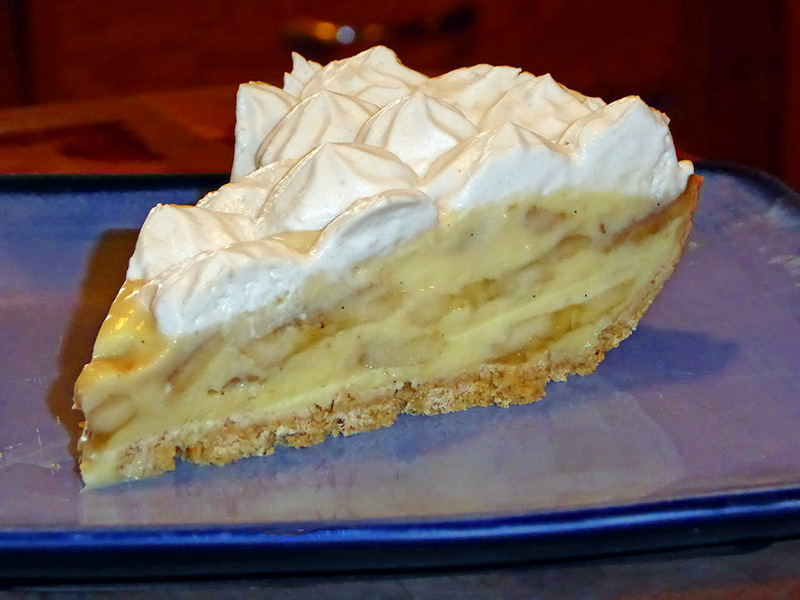 The filling is thick enough that it’s not really trying to escape, so that won’t result in breaches. Based on some other rough puff pastry recipes that do more than the two turns this one features, next time I’m also going to add the step of two more turns, for a total of four, after the initial 30-minute chilling, then chill the dough a further 30 minutes before the final 14×14″ rolling. This will produce 81 layers instead of just 9 from two turns. Traditional puff pastry dough gets five or six turns, producing 243 or 729 layers, respectively. Sour cream is used here as the liquid instead of the water used in traditional puff pastry for four reasons: 1) adds liquid with additional fat to the recipe (like butter & shortening or butter & lard), 2), adds acidity that reacts with the baking powder (which reacts to both heat and acid), 3) tenderizes the gluten in the flour for a more delicate texture, and 4) helps baked goods in general retain moisture so they’re not dry husks after a day. Not that there are going to be any of these left in 24 hours, mind you. 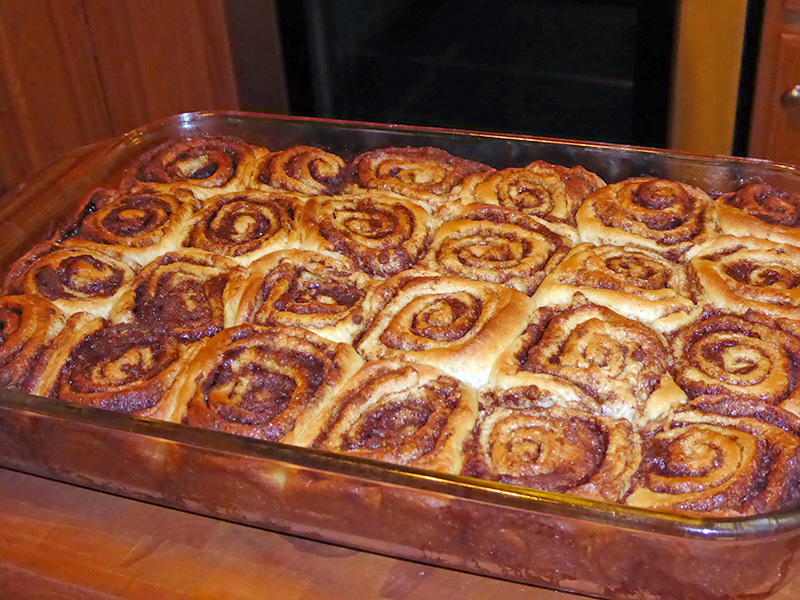 This is my new favourite recipe for cinnamon buns. With a dough not too far away from a brioche, they’re a bit crispy on the outside and, inside, beautifully soft and light but not mushy. Ahead of time: An hour or two ahead, take two sticks of butter (three if you’re doubling the icing), a package of cream cheese, and two eggs out of the fridge so they can warm to room temperature. Note that you can use salted butter if you want – there’s a negligible 1/8th teaspoon of salt in a quarter-pound salted stick, so it won’t make an appreciable difference. Ratios are crucial in baking, so I measure by weight – especially important for the flour. 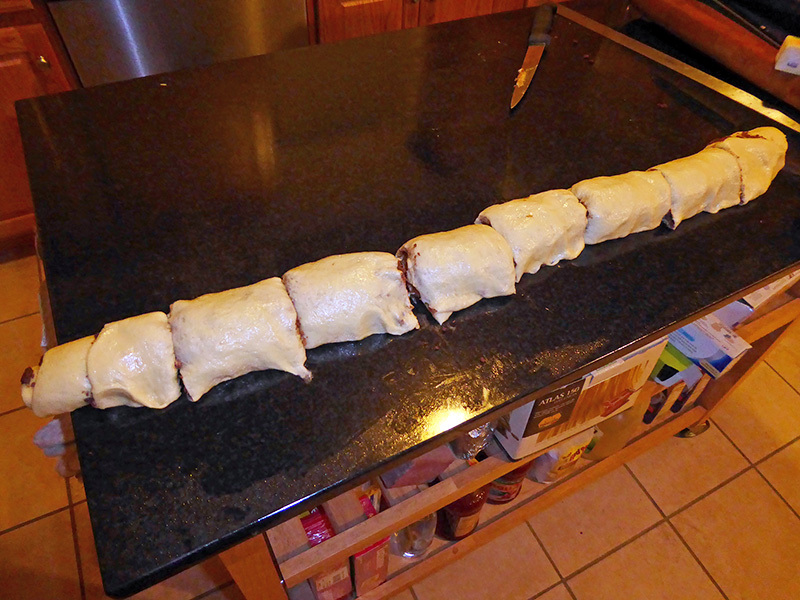 Deflate and roll out the dough: Gently deflate the dough, and transfer it to a lightly greased work surface. [It’s very important to grease the surface – you’ll need two feet by a foot-and-a-half – because you’re rolling a fairly wet dough to 3-4mm thickness and it would stick like tape otherwise. 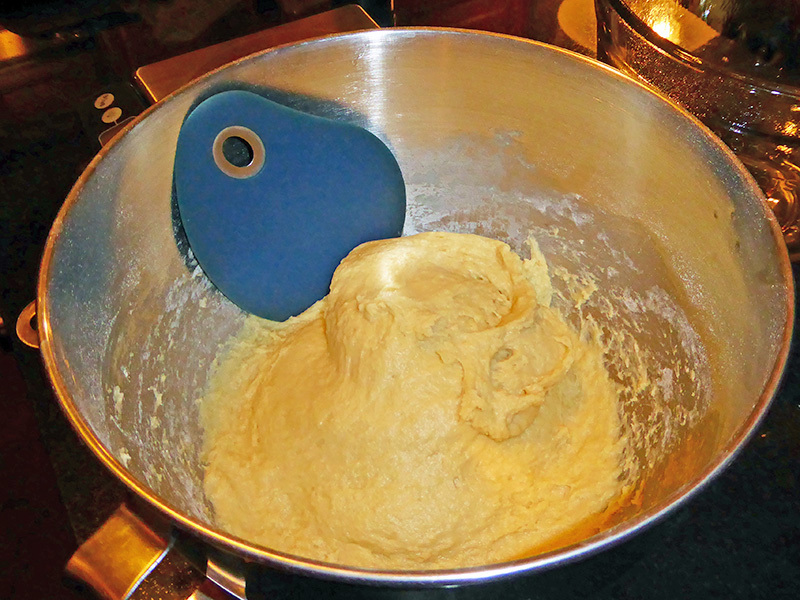 This may seem daunting, but don’t worry, the dough is very pliable and easy to stretch without tearing.] 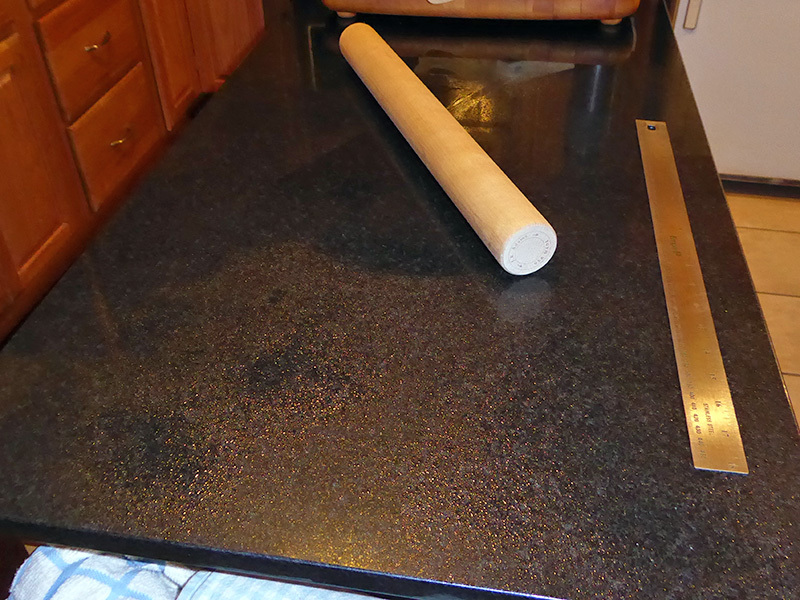 Pat the dough out into a rough rectangle, then roll to 16×21″/40x53cm, keeping the corners as square as practical. 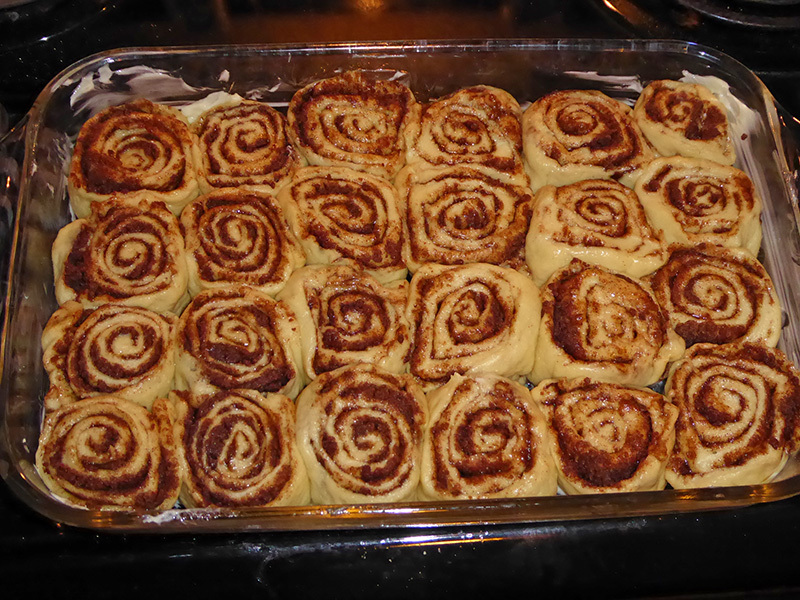 Filling: [For this step, I find it’s easier to microwave the butter, brown sugar, and cinnamon for about 30 seconds, then mix to form a paste that you can spread fairly evenly onto the dough. Allow it to cool a bit if it feels hot. This method also stops a bunch of the filling from falling out and ending up on the bottom of your pan.] 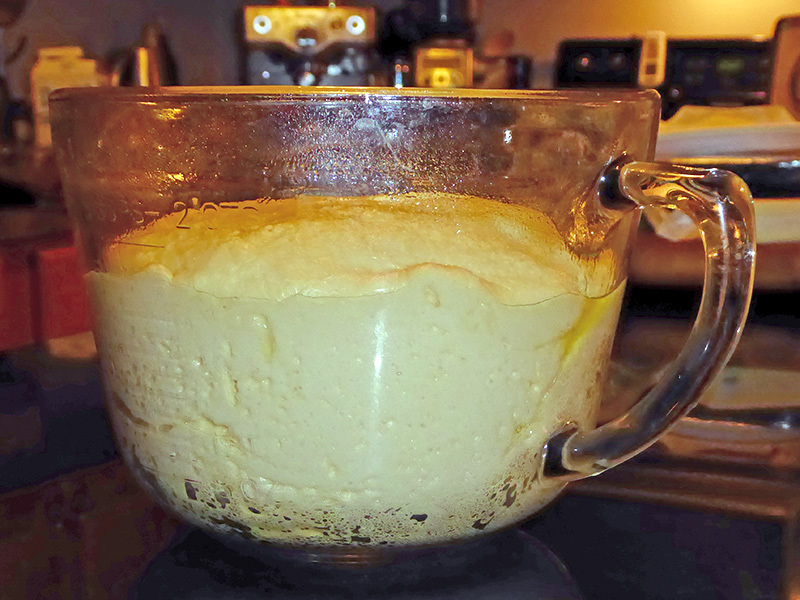 Original method: Spread the dough with the 1/3 cup butter. 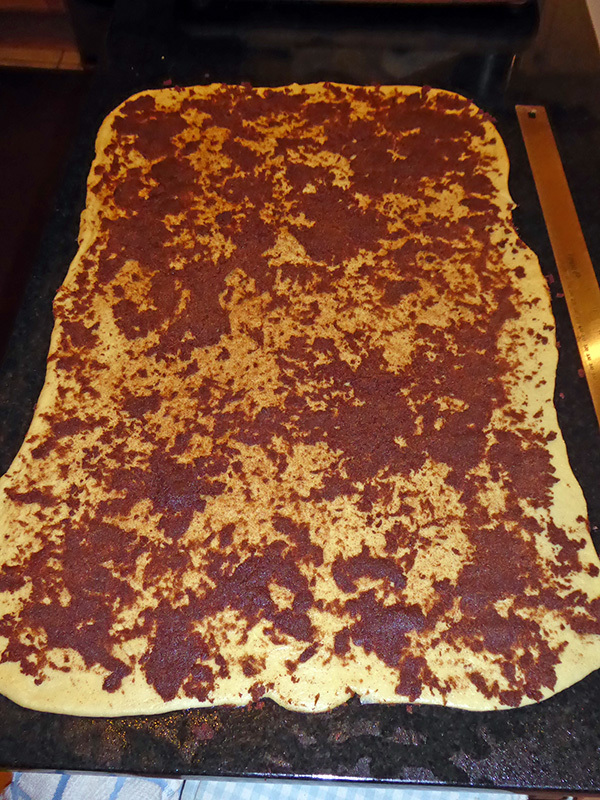 Mix the brown sugar and cinnamon, and sprinkle it evenly over the dough. 8. 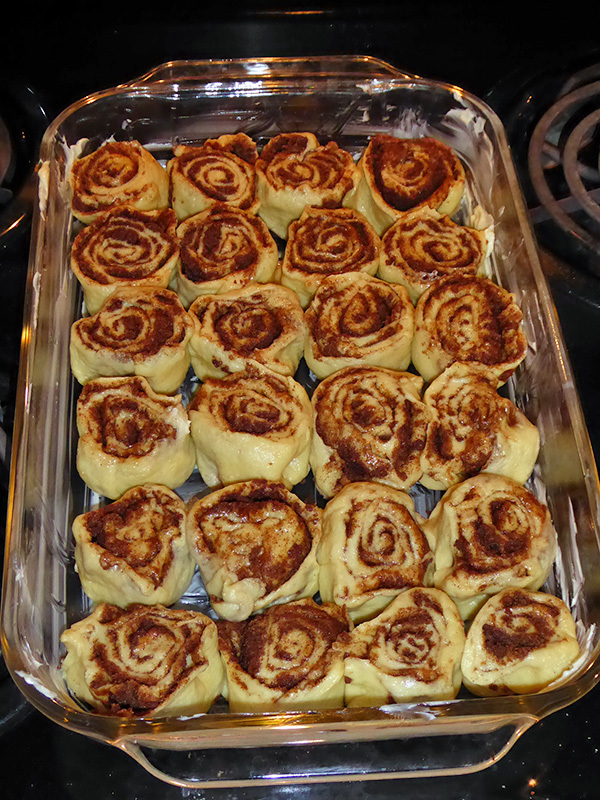 Uncover the buns, and bake them until they’re golden brown, about 15 minutes. [Check them every few minutes starting at 15 minutes, but I’ve found that golden brown won’t appear until more than 20 minutes have passed. If you have a probe thermometer, 190-195F/87-90C inside the center buns is your target.] While the buns are baking, make the icing. 11. 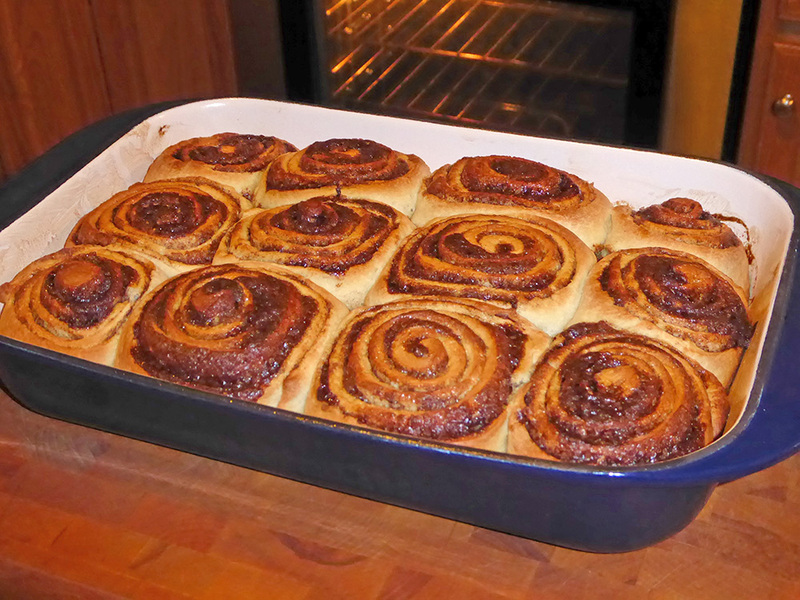 Serve buns warm, or at room temperature. [Room temperature? Stop it.] Wrap in plastic and store at room temperature for a day or so; freeze for longer storage.